Here at Integrated Dermatology, we provide a new alternative to treat troublesome acne with the Isolaz treatment. Our physician assistants have been providing Isolaz treatments for over four years and we continue to see undeniable results. Isolaz acne treatment with deep pore purification is a unique acne therapy that combines vacuum and painless broadband light to deep clean and purify your pores from the inside out. Isolaz acne therapy treats acne without lifestyle changes, oral medications, or topical medications. It is a reliable and effective acne therapy, with quick and long-lasting results for all skin types. Imagine waking up with clear, radiant skin that is free of blemishes. This can become a reality with Isolaz. Pore Cleansing: Vacuum helps loosen and extract dirt, blackheads, and excess oil from deep within your pores. Broadband Light: Helps destroy acne causing bacteria, as well as reduces facial redness. This effective acne light treatment, is based on Photopneumatics™ (Photo = Light, Pneumatics = vacuum), a proprietary technology available only with Isolaz treatments. Isolaz is a quick, easy, and painless way to treat acne. In fact, many people have their treatments done during lunch without any downtime. Patients have found their skin feels refreshed and has a healthy, radiant glow following Isolaz acne treatment. Also, Isolaz acne treatment is effective on all skin types. Why should I choose Integrated Dermatology for my Isolaz treatment? At Integrated Dermatology, our physician assistants provide Isolaz treatments to our patients. We have been treating patients with Isolaz since 2012. How Does Isolaz Acne Treatment Purifies my pores? The Isolaz vacuum applies gentle pressure on your pores while the light helps destroy the acne causing bacteria. This helps soften and remove blackheads, dead cells, and other debris from deep in your pores, resulting in radiant, clear skin that is purified from the inside out. Isolaz acne treatment helps treat mild to moderate existing acne while helping prevent future breakouts for a healthier looking complexion. What should I Expect During my Isolaz Acne Treatment? Isolaz acne treatments are quick, easy and painless: You will feel a gentle and warm sensation as your skin is drawn into the treatment tip with the vacuum technology. In less than a second, a flash of light will be applied. Your treatment provider will then move on to the next treatment area, and repeat the process over the entire treatment area. In a recent clinical study, 100% of patients reported no pain during treatment. Treatment sensation was most commonly described as being similar to that of a warm massage. Isolaz treatment is also very fast. Faces are often treated in under 20 minutes, other body areas in less than 30 minutes. Can I resume my normal activities After my Isolaz Treatment? There are no post-treatment regimens associated with Isolaz therapy. Once your treatment is complete, you are free to resume your normal activities. In fact, you may apply makeup or shave immediately. You may find that your skin takes on a healthy glow and feels cleaner immediately following your treatment. Is the Isolaz acne treatment cleared by the FDA? Yes. In fact, the Isolaz is the first system indicated to treat severe forms of acne, such as pustular and comedonal acne, as well as mild to moderate inflammatory acne. Is the Isolaz acne treatment really painless? Yes. In a published clinical study, an impressive 100% of patients noted Isolaz acne treatments were painless. How long is an Isolaz acne treatment? It depends on the area of the body being treated; treatments on the face may take 15 to 20 minutes, whereas body treatments may take a little longer. Will I have sensitivity to light following my Isolaz acne treatment? No. Unlike other treatments, Isolaz treatment does not cause sensitivity to light. Have patients been happy with Isolaz results? According to a clinical study, 100% of patients surveyed noted that they would choose Isolaz acne treatment over previously experienced treatments. What skin types can be treated with Isolaz acne therapy? All skin types, light and dark, can be treated using Isolaz acne treatment. Is there downtime associated with the Isolaz acne treatment? Isolaz acne treatments are relaxing and do not include side effects such as crusting or other common post-treatment discomforts. There may be mild redness that lasts less than an hour. You can go right back to your normal activities immediately post-treatment. Will I respond to Isolaz if I have not responded to Accutane® (Isotretinoin)? While everyone is different, many patients who have not responded to other acne treatments have responded to Isolaz treatments. Am I a candidate for Isolaz Acne Therapy? Any person who has acne may be a candidate. We recommend you come in for a consultation to discuss if Isolaz is the right treatment for you. Isolaz is the only system indicated for the treatment of pustular and comedonal acne, as well as mild to moderate acne and acne vulgaris. Depending on your own situation, you may be instructed to continue to use other acne treatments while undergoing Isolaz treatments. Does the Isolaz work 100% of the time? What if I only get a breakout every once in a while–could I still have an Isolaz treatment? Of course! Because the Isolaz uses vacuum for deep pore cleansing, which will leave you with healthy, radiant looking skin. Many patients see best results after 6-10 treatments, however it does vary from patient-to-patient. We provide packages to help patients save while receiving the best treatment for their skin. A single session is $250. A Package of 6 treatments is $1,250. 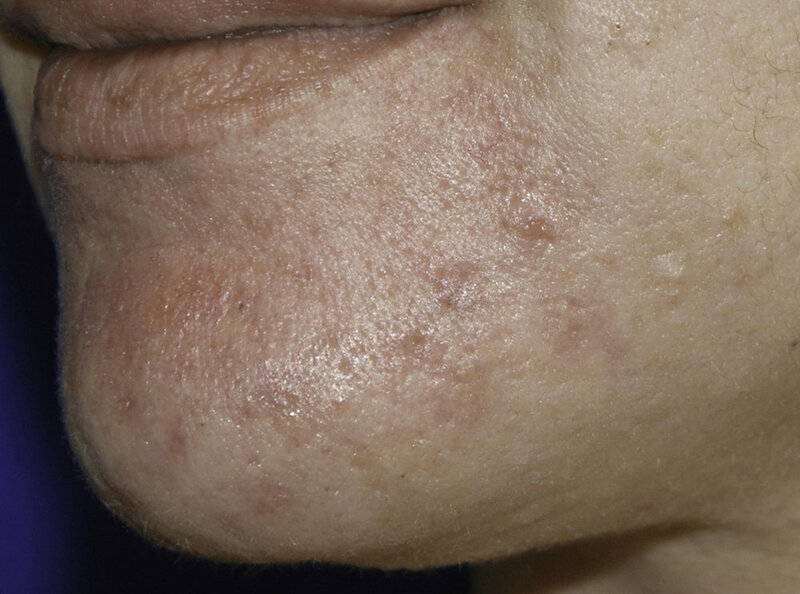 Many patients see the additional benefit of reduced redness after an Isolaz acne light treatment.